FreeMediaOnline.org, Free Media Online Blog, GovoritAmerika.us, July 09, 2009, San Francisco — While other U.S. government computer networks have long been back in operation after the cyber attack launched last weekend, the lead Federal agency in charge of communicating with the world on behalf of the United States suffered a catastrophic failure, which it has been unable to overcome for several days. As of Thursday morning, the Voice of America (VOA), the main U.S. international broadcaster, still could not make its main website, voanews.com, operational, days after a suspected North Korean cyber attack. 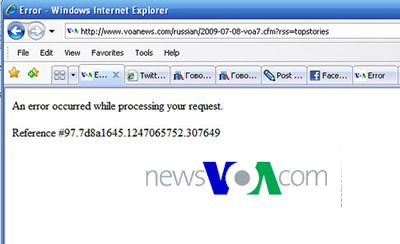 Those attempting to access VOA multilingual websitesÂ were still experiencing major problems Thursday morning. The main VOA EnglishÂ website andÂ foreign language websitesÂ were partially restored by early afternoon Thursday. VOA Internet Office Director Michael Messinger said visits to the agency’s website were down by about 40,000 a day. He said although difficult to pinpoint, the attack appears to have originated in South Korea. He said the attack has caused a “significant disruption” to the VOA servers. Some VOA journalists suspect that the 40,000 figure appears as an attempt to vastly minimize the extent and the seriousness of the problem, considering that most Internet users around the world were not able to see the VOA website for a number of days. According to sources within VOA, officials in charge of the agency’s websites did not immediately inform their superiors, the oversight Board and other U.S. international broadcasting entities about the catastrophic Internet failure at the Voice of America. A spokesman for the San Francisco-based media freedom organization, FreeMediaOnline.org, said that the inability of the Voice of America to reach Internet users over a number of days in countries like Iran, Russia and China represents a devastating flaw in U.S.-funded independent international journalism and public diplomacy. Ted Lipien, president and founder of FreeMediaOnline.org, said that the latest crisis exposed critical shortcomings in the policies of the Broadcasting Board of Governors, BBG, which manages VOA and was rated by the U.S. Office of Personnel Management (OPM) as one of the worst-managed Federal agencies. In recent years, the BBG has come under severe criticism for eliminating radio broadcasts to a number of countries, including Russia, Ukraine and India. In 2008, the BBG adopted an Internet-only strategy for VOA in Russia, ignoring warnings members of Congress and media freedom organizations that such a strategy posed a national security risk and further undermined media freedom. While other U.S. government agencies were also affected by the latest cyber attack, most managed to keep their websites operational or restored them quickly to full use. The VOA websites in English and in many other languages have been now largely unavailable for more than two days. According to Ted Lipien, the Broadcasting Board of Governors has had a long record of major strategic blunders. In the summer of 2008, the BBG terminated all VOA radio and television broadcasts to Russia. The radio went silent just 12 days before Russia invaded parts of the Republic of Georgia in a territorial dispute. The then BBG chairman, James K. Glassman, who later became President Bush’s last Under Secretary of State for Public Diplomacy, refused urgent pleas from VOA journalists to restore radio broadcasts to the war zone in Georgia and to Russia. He was supported by a senior Democratic BBG member, Edward E. Kaufman, a former Senate aide to Joe Biden who is now a U.S. senator from Delaware. The BBG’s decision caused an unprecedented 98% drop in VOA’s annual audience reach in Russia. The Voice of America Russian website was largely unavailable Tuesday, the last full day of President Obama’s visit to Russia, during which he met with the Russian opposition leaders. The official Russian TV channels, which are controlled by the Kremlin, provided no live coverage or extensive reporting on President Obama’s comments on human rights and media freedom. Commenting on the latest cyber attack against the Voice of America website, Ted Lipien of FreeMediaOnline.org said that the Internet plays a critical role in bringing information to countries under government censorship, but he added that the BBG made a serious mistake when it ended on-air VOA radio programs in Russian. â€œIf North Korean hackers can shut down the VOA website, security services of other countries can easily do the same, especially in time of a major international crisis. It may be coincidence that the suspected North Korean cyber attack happened during President Obamaâ€™s historic visit to Moscow, but Internet users in Russia were effectively prevented from learning from the Voice of America about the U.S. presidentâ€™s meeting with Russian opposition leaders. The democratic opposition in Russia criticizes President Dmitry Medvedev and Prime Minister Putin, a former KGB spy, of stifling independent media,â€ Lipien said. He urged the Obama Administration to provide the Voice of America with funding to adopt a multimedia program delivery strategy to countries like Russia and to make its websites less vulnerable to cyber attacks in the future. Ted Lipien is a journalist, media marketing expert and a former acting associate director of the Voice of America. No user commented in " U.S. International Broadcaster Voice of America Unable to Recover from a Crippling Cyber Attack for More Than Two Days "